This one should knock your socks clean off your feet. 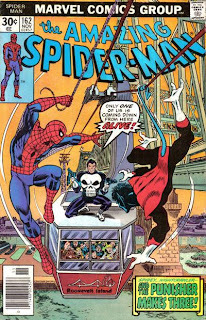 Amazing Spider-Man #162, the issue that I'm going to focus on here, is listed over at the Grand Comic Book Database as being credited to Ross Andru, naturally, however instead of the penciler credit that he should have gotten, they've listed him as providing breakdowns and Mike Esposito as being the final penciler. I have some bad news for them - they're slightly wrong, in fact, more than slightly wrong. For, you see, as will be shown very shortly, Ross Andru provided full pencils. Mike inked the issue, and more than likely utilised the services of Dave Hunt to assist him on the backgrounds, as was his wont at the time. How do I know this? Simple - I have scans of two pages of Ross's pencils from the issue in question.